This spicy appetizer couldn't be any easier to prepare and has a great flavor. 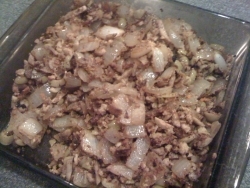 In a skillet heat olive oil and saute the onion until translucent. Add the mushrooms, hot pepper and garlic and continue sauteing until the onions are golden brown. Add the olives, breadcrumbs and black pepper and saute for additional 2 - 3 minutes, stirring constantly. Add olive oil if dry. This recipe turned out well. For the hot pepper I used a habanero pepper, seeded and chopped finely. In spite of the pepper, this dish was only very mildly hot. You can get dark green zucchini here in Israel, they call them kishu'im yeuirkm. We get some gorgeous organic zucchini at the Superson Deal in our town, they have a Green organic/health section. I make something very similar to your kugel but I dot it with half-moon slices of tomato on top (3 across, 3 down) for some color contrast. I also use soy milk instead of water.Have a happy tofurkey day!